These blueberries are grown locally from New Jersey. They're not particularly sweet but very plump and juicy though. These tarts are easy to make: the shells used by six phyllo sheets (please follow the cooking direction), baked in a medium-hot oven for less than 10 minutes. 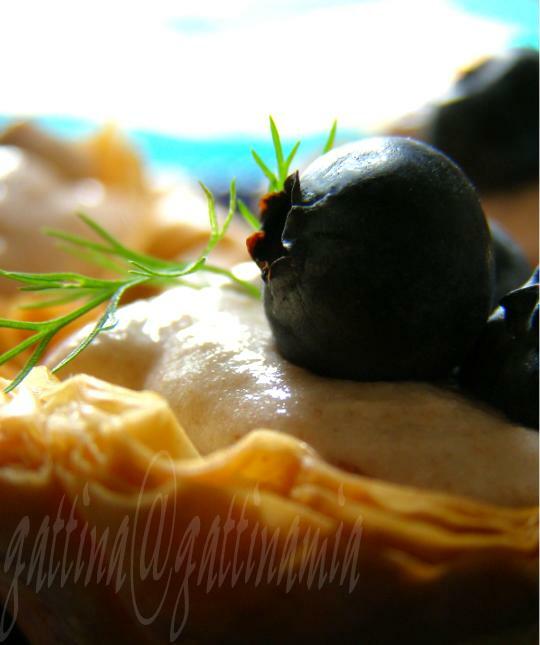 For the mousse, I just folded the blueberry preserve into whipped cream, piped the cream into the cooled phyllo shells, garish with blueberries and summer herb. How lovely !!!! Excellent photos. Did you form the cups in a muffin pan? hi gattina, how r u? =) i really like your photos! who else could make blueberries look as beautiful as yours? you're so talented! 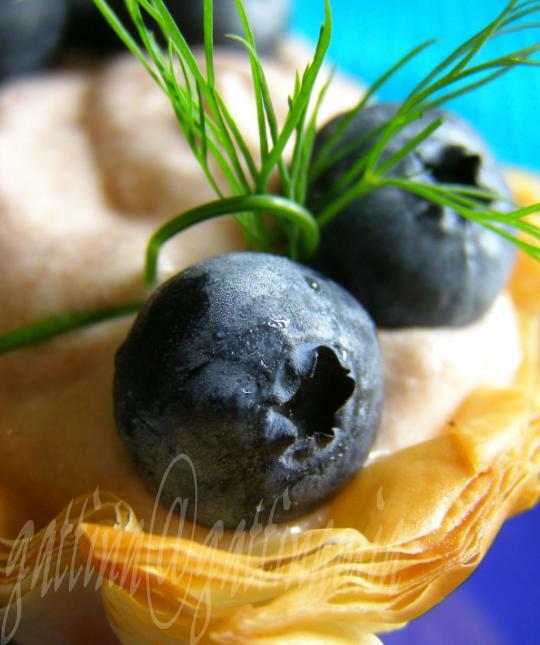 The blueberry tarts are beautiful. I think this is one of the healthiest fruits, and also one of my favorites. Your photos are wonderful. Gattina, I just now noticed you are from Hong Kong!! I don't know how I missed this before. I went there in 2001 with my brother and had a great time. We also went to Beijing, but only a few days there and 11 days in Hong Kong. My brother was actually there consulting on a tv commercial and he invited me to come since he had a lovely hotel suite. I had fun buying a lot of gold jewelry there, which I still wear all the time! I also went to visit a school which was most interesting. The public transit system was quite amazing, with the octopus pass. I'd love to go there again some time. yum yum. This type of dessert, I love! 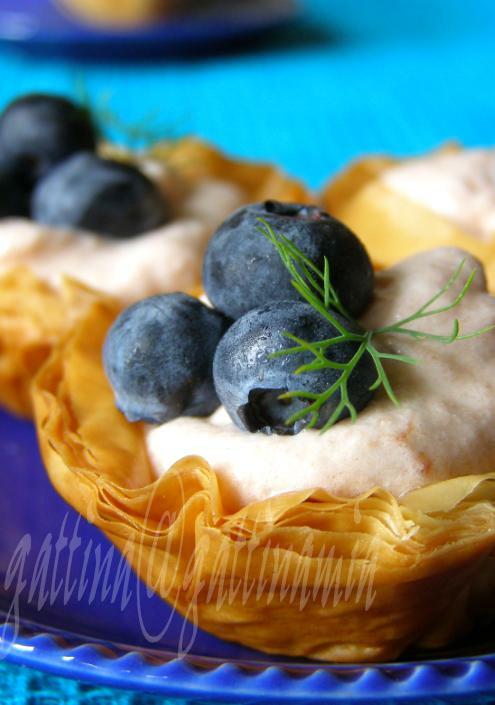 The phyllo pastry is a great idea! Looks fabulous ! Can I try the same recipe with fat-free cool whip ? I have a tub sitting in my freezer. Those look so lovely--light and crispy and creamy all at once. Beautiful pictures. I want one! This is lovely! I really liked your blod, you have gorgeous pictures! I am going to add your blog to my list of favorites at my cooking blog, is it ok with you?! Very nice work, your blog is very pretty! Hi, Gattina. I found your recipe so no need to e-mail me the link for WHB. Watch for the recap tomorrow. Blueberries are my favorite berry and this dessert looks out of this world! Another great blueberry post. Super. Archana, thanks! I pushed the phyllo sheets into mini tart tray. Evan, sorry for my late reply... I'm out of town these two weeks. Your food and photos look absolutely wonderful!!! C'mon, I'm waiting to see more! Kirthika, I think you can... but better add a bit gelatin (disslove first) so as to enhance the consistency of the cool whip. Ana, thanks for your visit! And thank you so much for adding my blog! Christa, thanks for the compliment and your fantastic roundup! Vineela... please give me a stack of your lovely watermelon waffle then... hehee! Mae, thanks! My lips and teeth have turned blue these days; I can finish a pound in one go! good idea; blueberries are great for memory improvement too. Hey there , was planning to make something with blueberry mousse and googled it and found myself on your blog.Ne Hau Pang yao ! thats is i spelt it right.Those filo cups are really dainty and pretty.I'm glad i found your blog, i'll b visiting often.